Birthday Fun and a Winner! 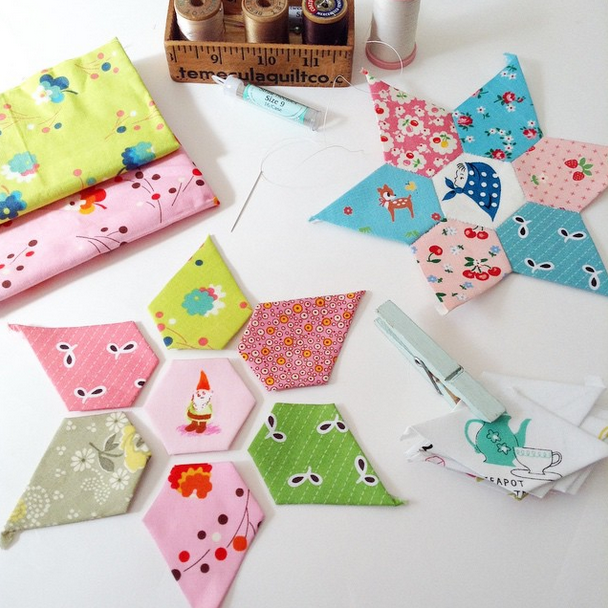 I'm having a lot of fun sewing these jewel star hexies. I am using small scraps for some pieces and really pushing it on seam allowance but this will be a mini for me so I'm not concerned about it too much. I so enjoy pulling out those precious pieces of fabric that you save for just the right thing, many from sweet friends, that I received in swaps over the years. Slowly working on a piece. I get really excited with each new star. The fussy cutting, well, you know, it's just the icing on the cake! My birthday was last weekend and I sat down for some birthday sewing! Only I didn't sew anything I had planned. 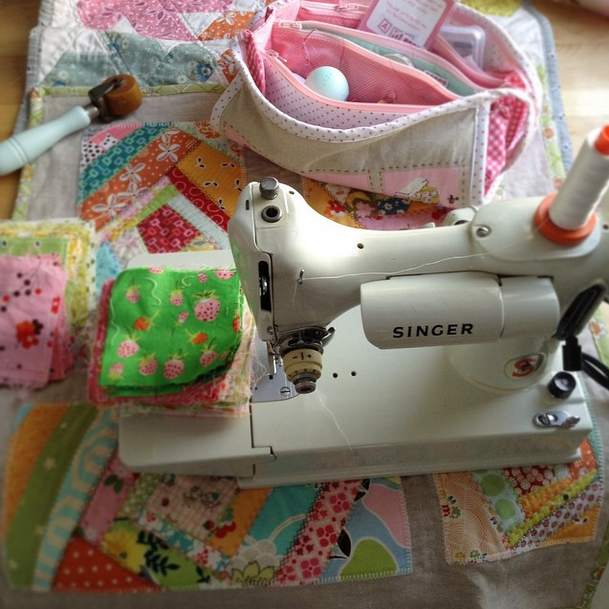 One of my girls wanted to sew. I could not refuse! She was so excited and loved every. single. minute!!! 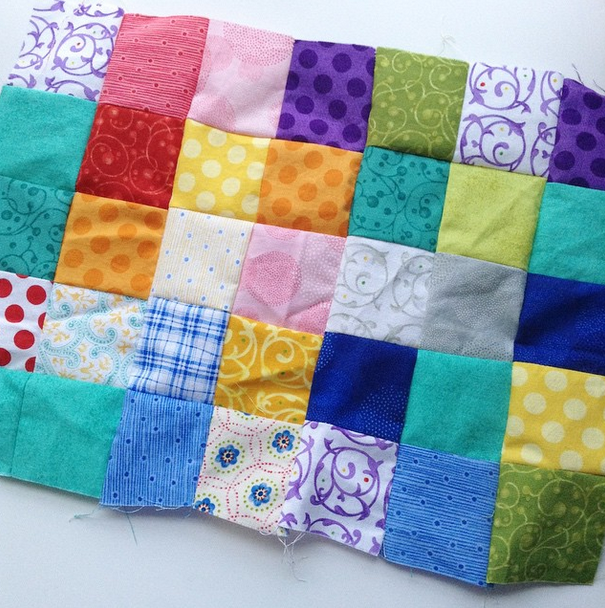 Here is the beginning of her placemat. I think it's beautiful! 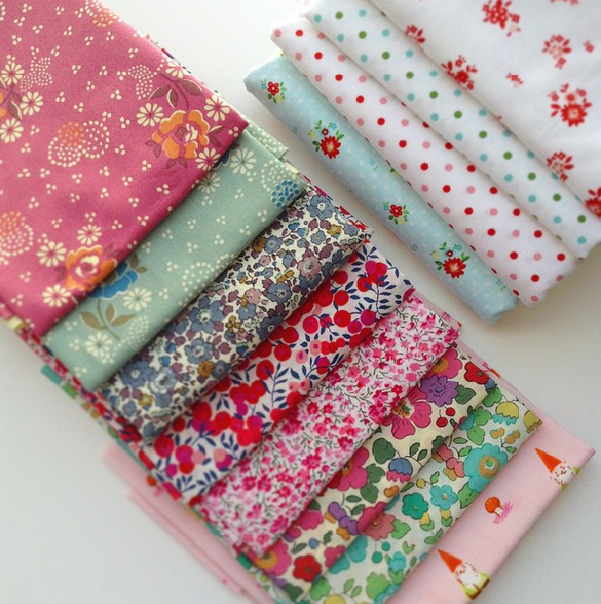 I ordered some pretty fabric for my birthday (of course)!!! Some lucious Liberty prints and some other favorites too! 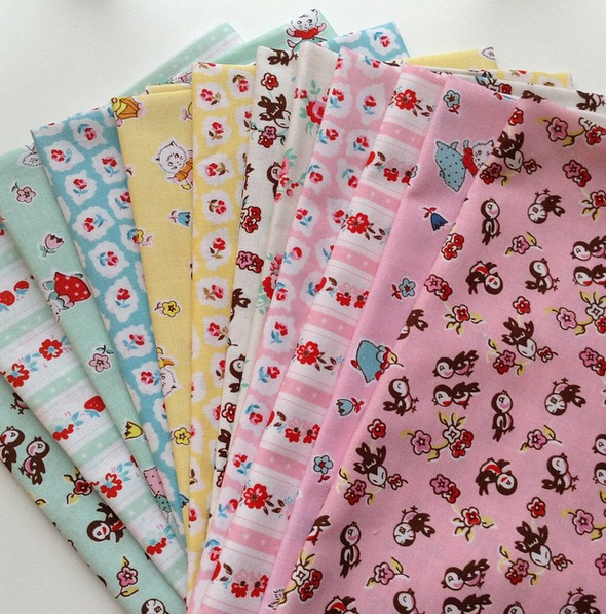 Another fabric line I've been drooling over lately is Lighthearted by the super sweet and talented Ayumi!!! These florals are so pretty with the tiny strawberries too, gah! love them! I have a couple of things I've been working on that I'll share another time. I feel a sense of freedom right now. I have 3 flimsies and only a handful of WIPs. It feels good to finish things up and also knowing what projects to let go of because your just not feeling it anymore. Time is far to precious to work on things you don't love. 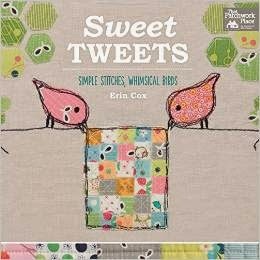 I'm slowly learning that just because I see a quilt that I absolutely adore doesn't always mean I have to make it or add it to "the list". It's okay to admire and move on, really! 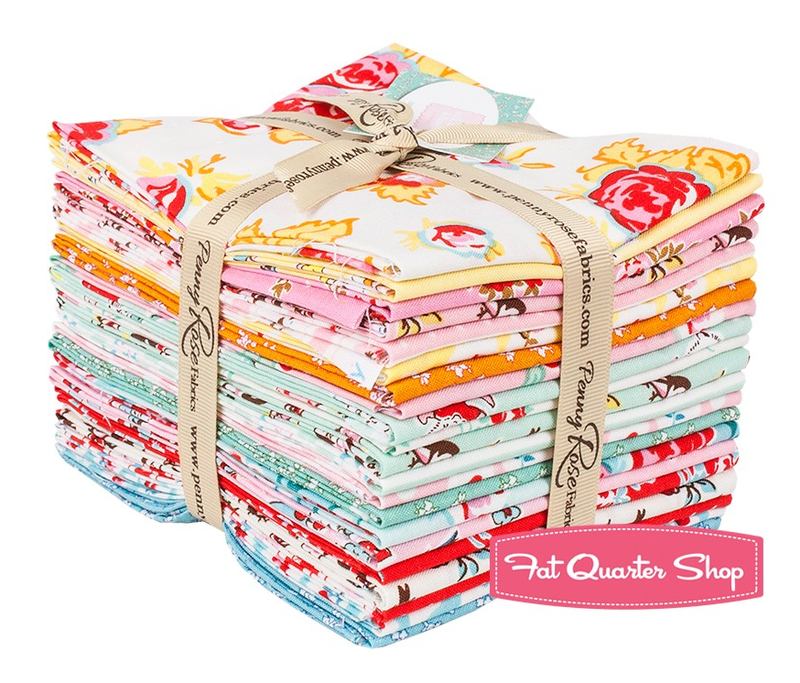 The winner of the Milk, Sugar & Flower FQ bundle from Fat Quarter Shop is Bruinbr / Kim! Congratulations Kim! Thank you all who entered. 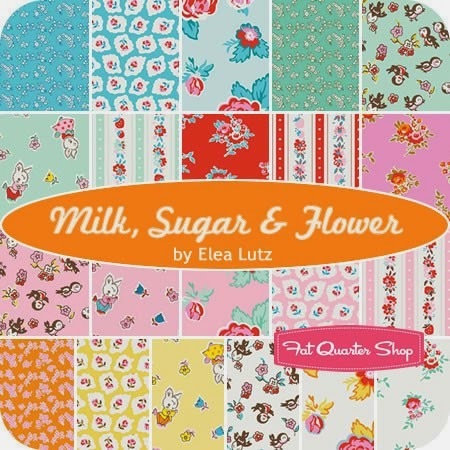 I am SO excited to giveaway this gorgeous fat quarter bundle of Milk, Sugar & Flower by Elea Lutz courtesy of our lovely friends at Fat Quarter Shop!!! 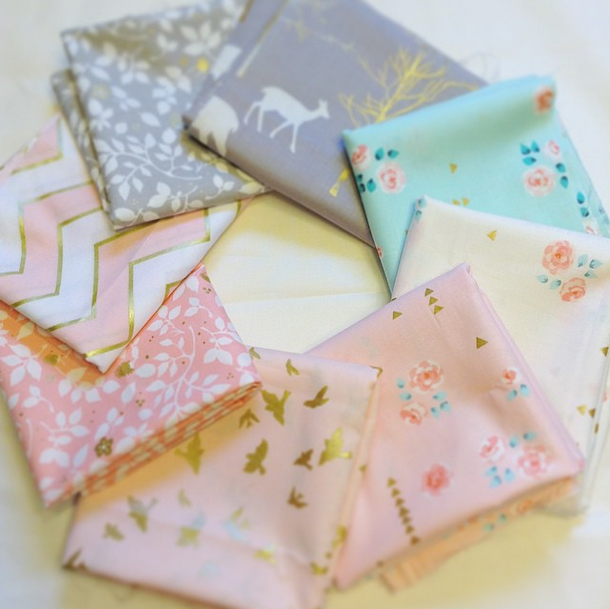 This new fabric line is all the rage on Instagram right now (check out #milksugarandflower) and for good reason. The colors and prints are incredibly sweet. They just make you happy looking at them. And they won't give you cavities. Bonus! 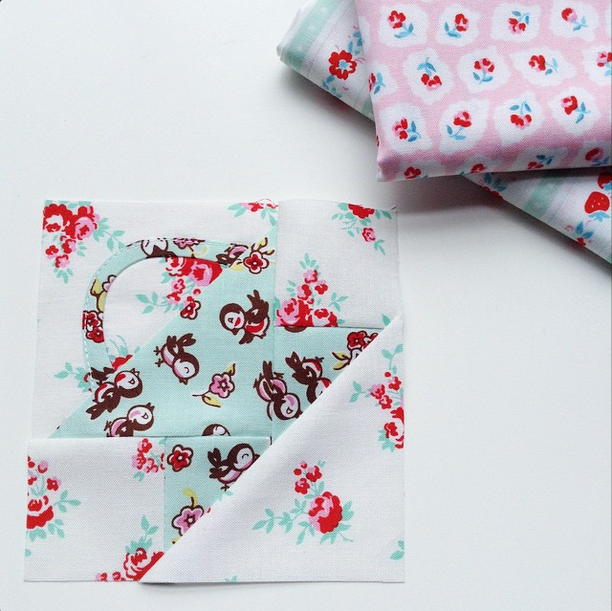 I simply adore this fabric and I know so many of you do too! I love seeing what others are making with it. Every project is so pretty! 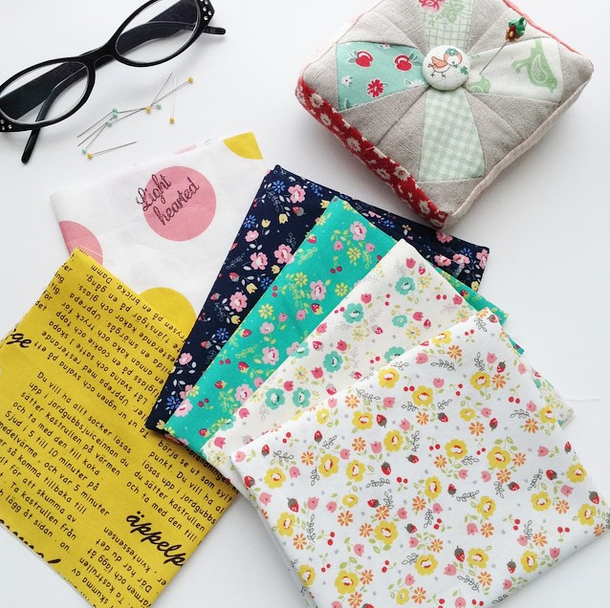 For a chance to win this FQ bundle just leave a comment! What would make with this stack of sweetness? or would you hoard it for a while?! 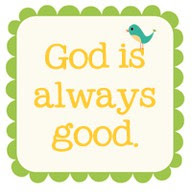 That's okay too!!! I'll announce a winner next week. I finished the Milk, Sugar & Flower mini I was working on in my previous post. I love how it turned out. 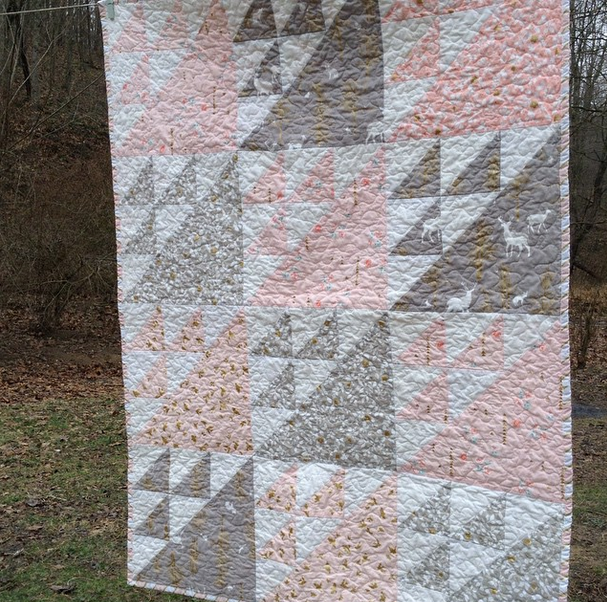 I quilted in the ditch around the basket blocks and then I quilted an outline around the prairie points. 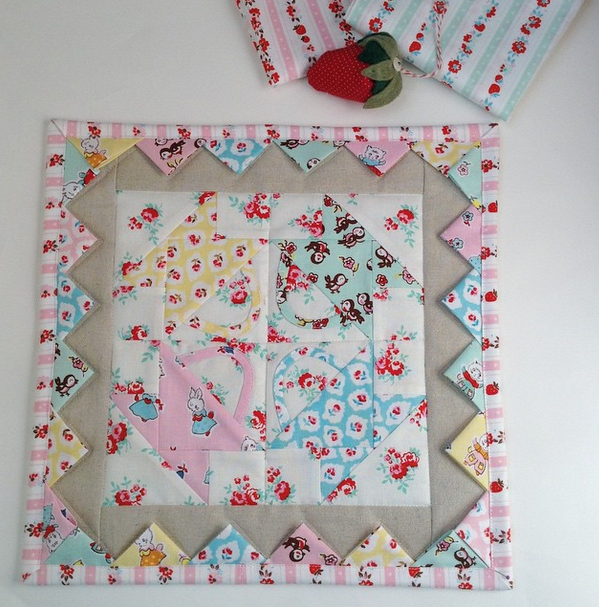 I bound it with one of the cute stripey patterns from this adorable fabric line! 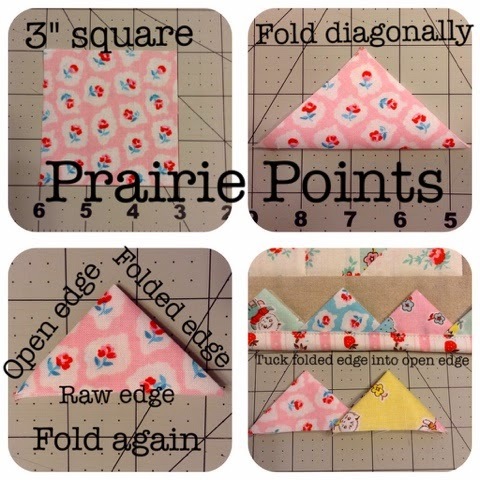 I made a little mosaic of how I made the prairie points for this little quilt. 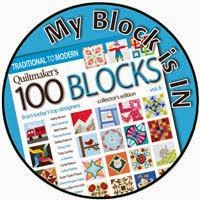 Of course there are a few ways to make them and the placement of mine are opposite of the traditional layout around a border. It's a very fun way to add a little extra to a mini or any size quilt. 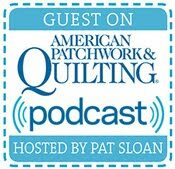 I use a stay stitch and add the prairie points to one side at a time. The I did the binding by machine attaching it to the back first and then flipping it to the front and sewing close to the edge of the binding. We are getting lots of snow here today! 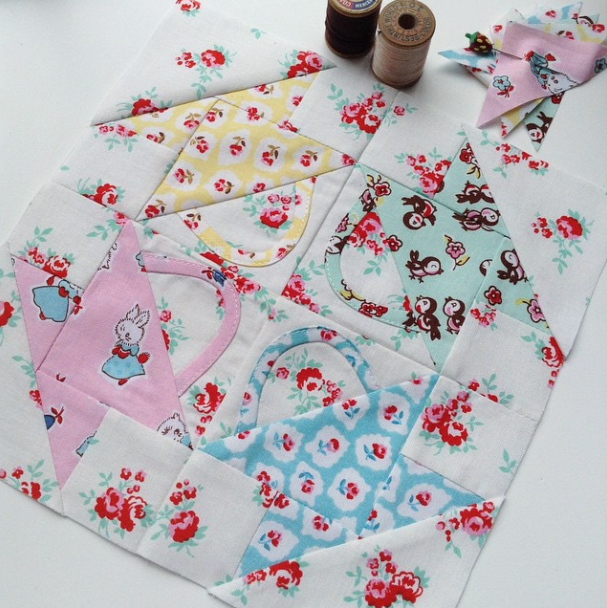 I think a pot of soup and hot cup of tea are in order....maybe some sewing!!! Stay warm and safe if your stuck in this mess too. Hi! It seems as though I've neglected my little space here and I'm sorry for that. With sharing projects and such on Instagram I'm trying to find the right balance and not over share here, there and everywhere. Also I haven't pulled my real camera out since Christmas. I have to remedy that soon but just snapping a picture is so easy these days. It allows for more time right now and who doesn't need that! But I want to share here because I enjoy my space here and I know many of you don't use Instagram. Beautiful fabric! The colors matched the babies nursery perfectly so I was really pleased with that! Also I got the cutest bundle of Milk, Sugar & Flower by Elea Lutz!!! 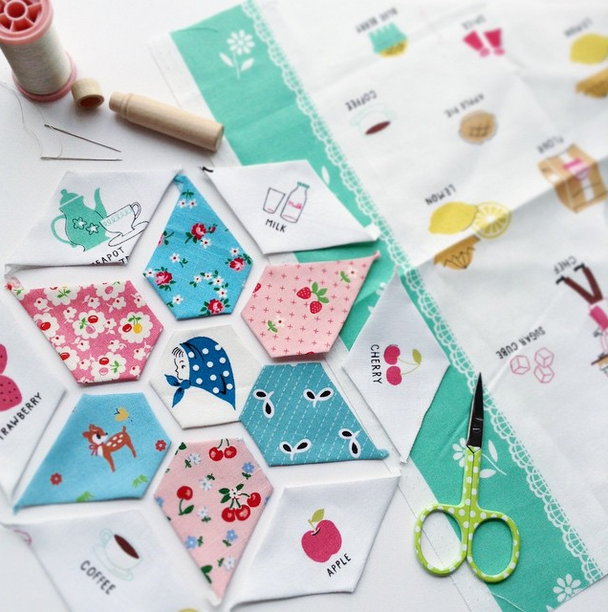 There are so many cute projects being made with this on IG right now!!! I am making another mini for a friend. I chose the Postage Stamp Basket for the mini. 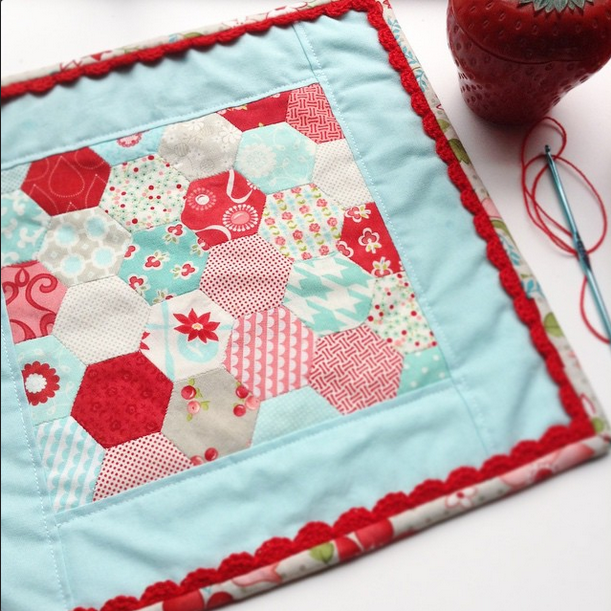 I think it's perfect with these fabrics! I used a tutorial by Alex Anderson for a 4" basket. The link is HERE. It's a video on You Tube. I'll share the rest of the mini when I finish! Hope you are working on something that is making you happy right now!! !